- until you go paperless. You're used to handling regulations around student health and safety. But this time, it's different. When GDPR goes into effect on on May 25th, protecting your students means protecting their sensitive medical data too. If you're still managing your students' health using a paper-based system, GDPR means you’ll have to constantly document every detail around student records: Who's accessing them? For what purpose? For how long? You'll even have to prove that you're processing and storing student data securely - no easy feat from a file cabinet. Under GDPR, you'll be spending exponentially more time trying to stay compliant with the law and less time caring for students. But when you go paperless? Life at school is dramatically different. You can move your records to our GDPR compliant online system within a week. 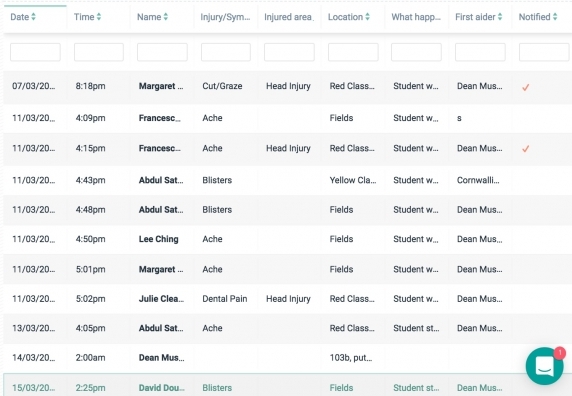 Medical Tracker is your one central place to report first aid incidents, track medications and student care plans. Our online forms are built to comply with DFE, OFSTED and RIDDOR guidelines, so you don't have to think twice about capturing the right information. Documents? Forms? Medical records? Under GDPR, paperwork that isn't fully secure and safe from prying eyes is a potential legal liability. "When I saw it in action I immediately knew it would save time and be a much more efficient system." Balancing student care with security gets trickier under new GDPR rules. With Medical Tracker, you can limit access to each student's file to authorized staff and teachers only. They'll be able to pull up student medical history, along with allergies and care plans as needed. Medical Tracker keeps a record of who has accessed and made changes to data, so you and your school are automatically operating under GDPR guidelines. No extra work for you! "Parents and other professionals commented on how neat and precise the reports were." With the click of a button, Medical Tracker creates impressive, print-ready documents, including Governor, Health and Safety Council and RIDDOR reports. You will also be able to instantly complete subject access requests, which are expected to increase under GDPR. Digging through Excel spreadsheets and student files for hours just to pull a daily report has always been part of the job - until now. With Medical Tracker, you can complete an entire afternoon's worth of reporting work in just minutes. "Communications are immediate and our parents are aware their child has been in the medical room. It allows for instant communications." With automated emails sent via Medical Tracker, you can instantly communicate sensitive information to parents without worrying about potential data breaches. Once you enter the details in Medical Tracker, our system automatically notifies parents to refill their child's medication, inform them about incidents involving their child and any other health updates. "A number of our Midday Supervisors (who would primarily be using the system) were not IT literate and were quite against it. However, they became proficient within a very short time and have even shown other staff how to use it!" Medical Tracker has already helped 300 schools get ready for GDPR. © 2016 Medical Tracker Limited. All rights reserved. "Medical Tracker" and "Beautiful Tracking Software" are trademarks of Medical Tracker Limited. A conkaa product.